Have you ever heard the scripture found in II Chronicles 16:9, “For the eyes of the Lord run to and from throughout the whole earth to show Himself strong in behalf of those whose hearts are blameless toward Him…” It may surprise you to learn the context of that verse and the fascinating circumstances surrounding it. Baasha, the King of Israel came up against Judah in war and tried to starve the people out by besieging the Ramah. So Asa, the King of Judah, “…brought silver and gold out of the treasuries of the house of the Lord and of the king’s house and sent them to Ben-hadad king of Syria…saying, ‘Let there be a league between me and you…break your league with Baasha king of Israel, that he may withdraw from me.’” (v. 2,3). The Syrians, whose allegiance Asa had bought with gold from the Lord’s house came down and rescued the southern kingdom from the hand of Baasha. But the Lord was not pleased. 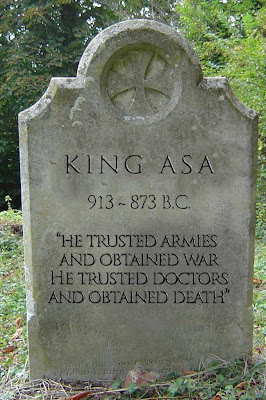 Asa trusted in armies and obtained war. He trusted in doctors and obtained death. The final verse of the chapter sums Asa’s life up with an almost contemptuous caption: “And they buried him in his own tomb which he had hewn out for himself…” In essence, Asa dug his own grave because he insisted on trusting in the arm of flesh rather then on the Lord. God was insulted by Asa’s disregard and gave him over to that which he feared most. I wonder how many Christians are suffering today because they didn’t trust in and seek the Lord in the midst of their trial. Faith often seems like the more difficult option. It is so much easier to trust a lawyer, a doctor, a colleague or a counselor. But after trusting in all of these other things, so many people find themselves given over to the very thing that they fear and in that moment they cry, “Why God!? !” Don’t wait until your wheels have fallen off before you cry out to the Lord. Seek the Lord while He may be found and call on Him when He is near. View your difficulty as merely an opportunity for the Lord to receive Glory. The eyes of God are going to and fro throughout the earth looking for someone through whom He can show himself mighty. He wants to receive glory through your sickness. He wants to receive praise through your financial emergency. He wants to receive honor through your family situation. Don’t deprive Him of the opportunity to be your “very present help in trouble.” Don’t lean on the arm of the flesh…don’t dig your own grave. Thanks for this message. You preached this on the 16th of July 2009 and on the 27th of July, you were in my hometown with Reinhard Bonnke. I hope you were able to share this with my people in Otukpo, Nigeria, the descendants of ASA. Pray for my people. They need deliverance from the spirit of trusting in man and not God.